Born from our diamond anniversary band RoyalT collection, some of our best clients were asking to celebrate with special occasion stacking rings that had more color. 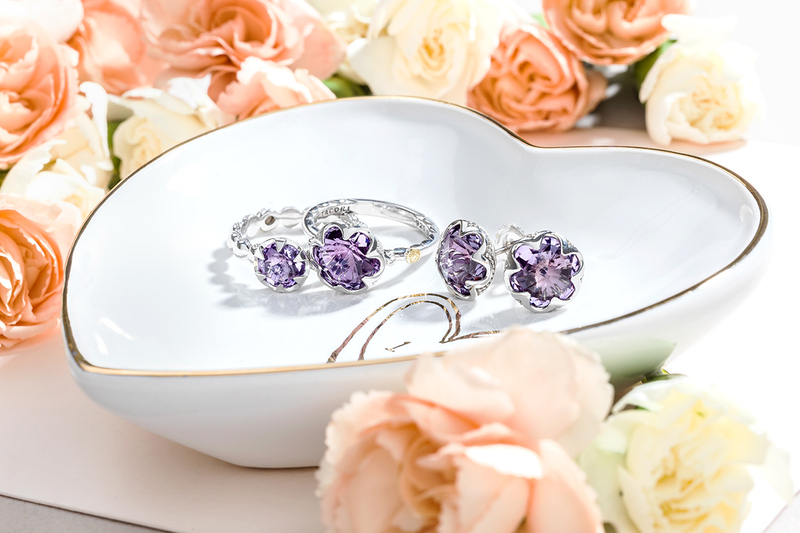 And by “color”, we mean that our clients wanted Sapphires and Rubies, in addition to Diamonds. Rubies and Sapphires and Diamonds, oh my! And who are we to say no, when saying “yes” is so much more fun? 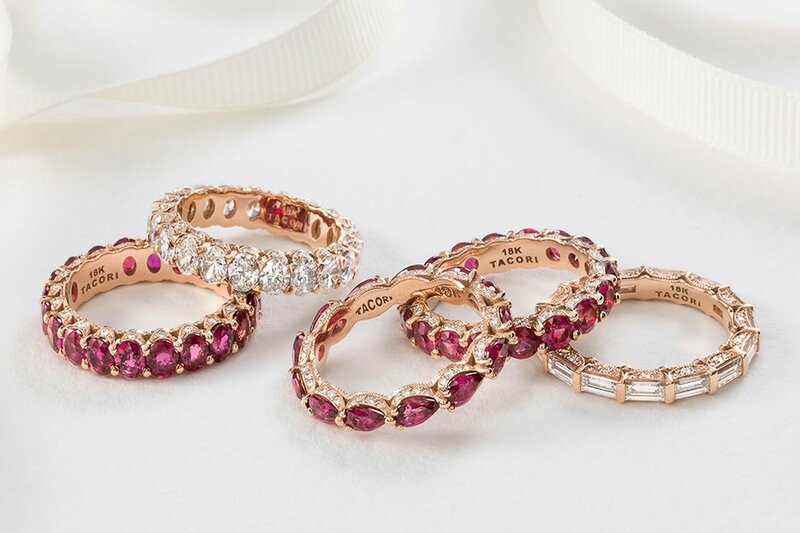 As next steps to create these incredible rings, our Designers took the best of our RoyalT anniversary rings to create an unforgettable eternity ring with rubies. 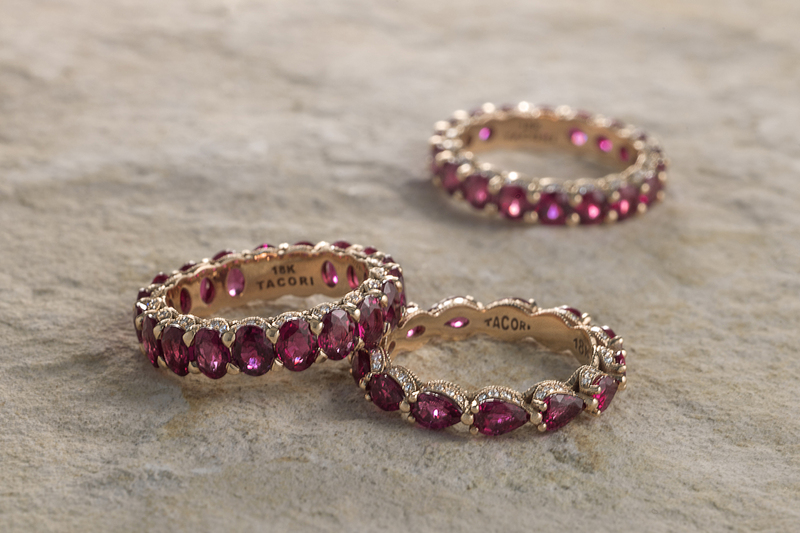 These are Ruby rings that you won’t find anywhere else, with details like only Tacori can do, handcrafted in California by master artisans under the guidance of the Tacori Family. We have a Ruby anniversary band with pear-shaped rubies. A Ruby wedding ring with oval-shaped rubies. And a Ruby wedding band with round-shaped rubies. And even a Ruby ring with marquise-shaped rubies. 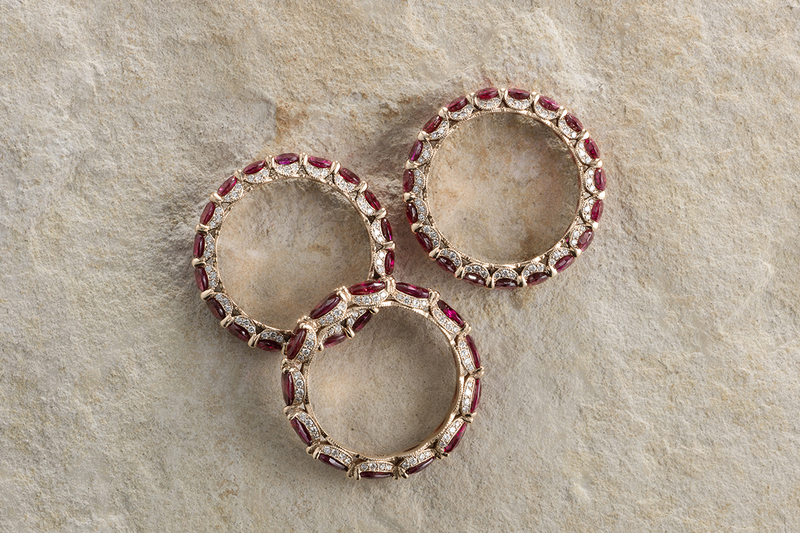 Each ruby eternity band is so special on their own as anniversary bands or a wedding ring, or, these eternity bands make great stackable rings for a showstopping statement. Worn solo, as a stack, or mixed-and-matched with other rings, you can create a look that’s uniquely yours. 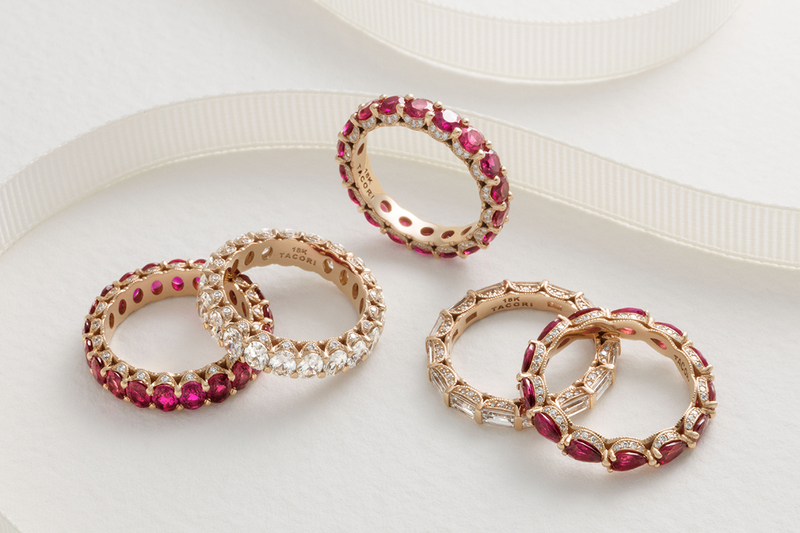 And did we mention that our Ruby rings look especially gorgeous when set within rose gold or yellow gold? We put together a ruby round up that’s going to have you looking for some more color in your life. There’s no place like home…on our fingers! Rubies anyone? 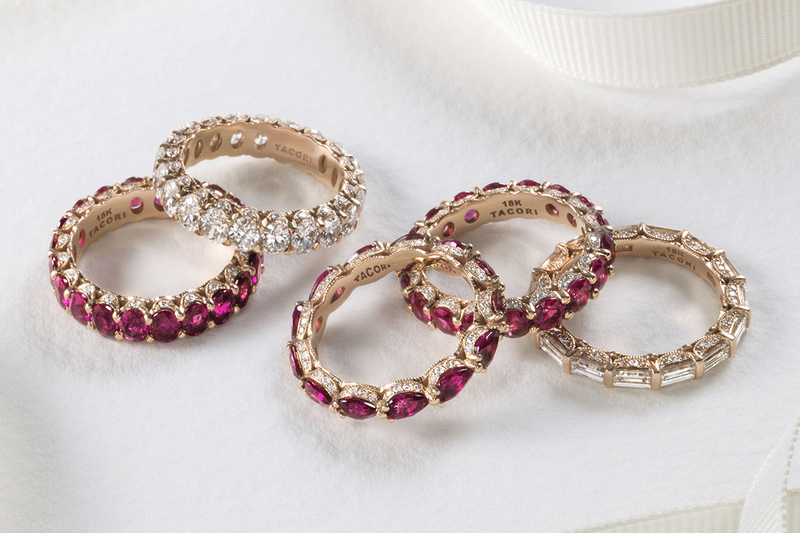 Stunning Ruby rings, set within romantic rose gold to complement the color of these hand-selected matching rubies. 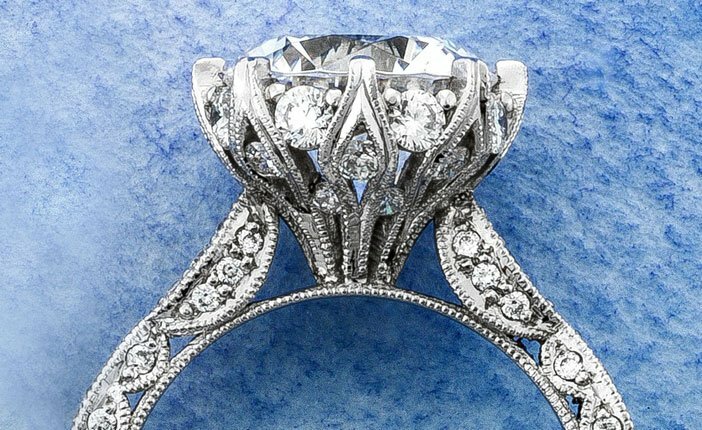 Don’t skip the side view to see the Truly Tacori details on the inner face of the rings. A ribbon runs through it. Here, you can see the beauty of the horizontally-set pear Ruby ring (far left), the round Ruby ring (middle) and the oval Ruby ring (at right), next to our exquisite diamond anniversary rings shown here with baguettes (2nd from left) and oval diamonds (2nd from right). And a few more views, just because it’s so beautiful! And were you wondering what happened with the Sapphire anniversary rings? Take a sneak peek below to see just one of our stunning Sapphire eternity bands! Ruby RoyalT Anniversary Bands, cont. How much do we love these rings? We’re already pinning and sharing so that we can send that #hinthint to our significant other for that upcoming Anniversary! It’s true. 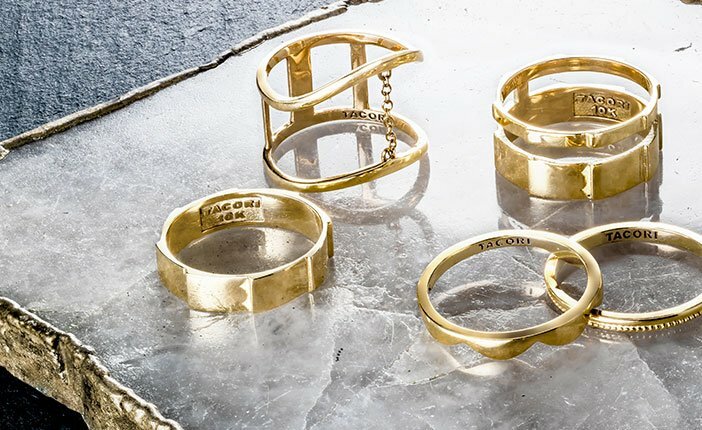 With this collection, Tacori takes stackable anniversary rings to new heights with exquisite attention to detail and beauty from every angle. 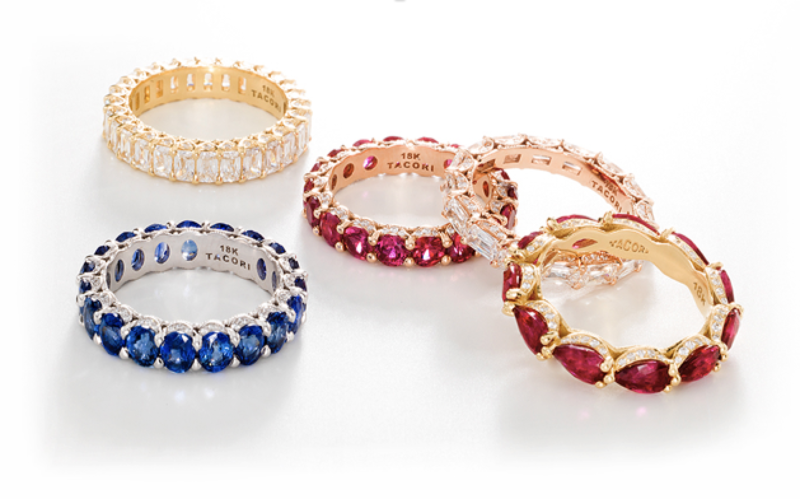 These wedding rings or anniversary bands are available in rubies, and there are more options in sapphires or diamonds. They are exclusive Tacori RoyalT with the signature Tacori Classic Crescent design on the inner face that makes them a distinctive choice. And now for the metal, stone and shape details, if you’re going to make decisions! For your metal options, each RoyalT anniversary ring is available in Platinum, Yellow Gold, Rose Gold or White Gold. For the shape options, there are different stone shapes to explore for the eternity Diamond, Sapphire or Ruby rings, such as: round, oval, pear, and marquise for the Ruby RoyalT Anniversary Bands, and there are also baguette sapphires, and a special *triple-cut diamond, which is only available in Diamond anniversary rings. Depending on the shape of the ruby you like (round, oval, pear or marquise), you can also choose from a “smaller” and a “larger” ruby size that suits your finger best. Ready to take this to the next level? Try them on in-person at a Tacori Retail Partner near you. 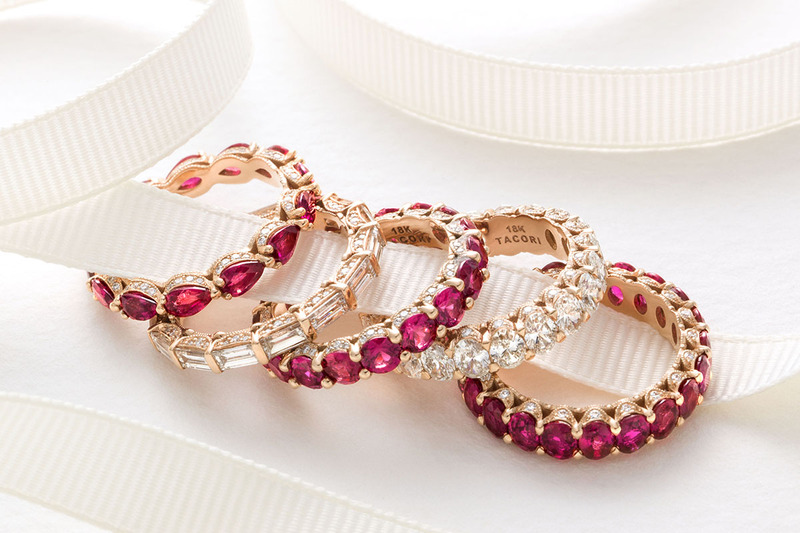 Due to extremely limited availability, we recommend calling first to see if your Retail Partner carries these incredible ruby rings in store, or if they can borrow a set from the Tacori Vault!